When I first put down roots in Rose Park, I was immediately impressed by its diversity and the overall sense of community within these few square city blocks. Being cut off from the rest of the city by golf courses, freeways and train yards, this tight-knit space feels much more like a small town than a neighborhood. And with this small-town vibe comes old family rivalries, innumerable traditions and a shared history that continues to bring people together. 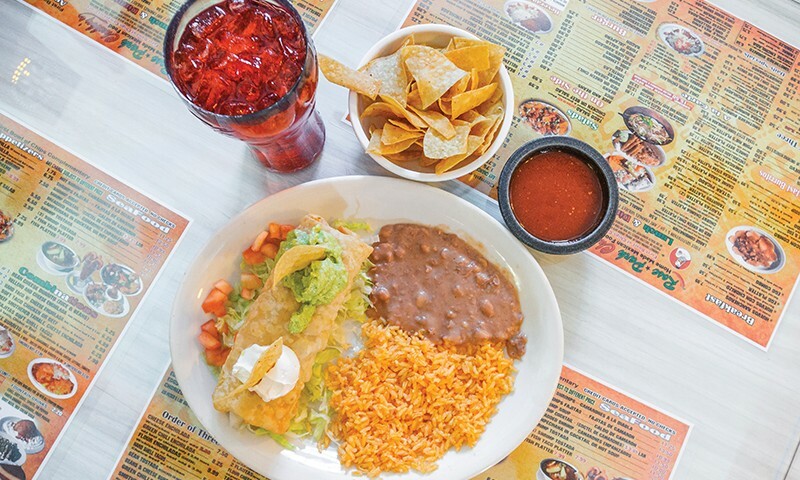 At the crossroads of this regional diversity and civic kinship, you will find a crown jewel of the River District restaurant scene: Chubby’s Mexican Restaurant. Chubby’s has been around for as long as anyone in the area can remember—supporting little league baseball, throwing parking lot parties for Cinco de Mayo and providing quality and consistently good Mexican comfort food for a reasonable price. It is as much a neighborhood staple as the Jordan River, yet it remains tucked away in Rose Park, hidden from those not willing to go north of North Temple for Mexican food. During a recent trip, I ordered the Chubby Changa Platter ($7.99), a crispy chimichanga burrito filled with your choice of ground beef, chicken or shredded beef, and served with mild savory Spanish rice and refried beans. For an extra buck, you can get it stuffed with grilled steak, and for an extra $2, they’ll even smother the whole thing with a chile verde sauce and cheese. I usually opt for the shredded beef option, and I never regret it. The beef is tender and flavorful, and the addition of sour cream and guacamole cuts the richness of the fried burrito and adds a bit of mellow creaminess to the platter. The times that I’ve ventured away from the Chubby Changa Platter, I’ve usually ended up ordering from the combination menu. A favorite is Combination #5 ($5.99), a beef tamale smothered in chile verde sauce and paired with a cheese enchilada. The decadence is high with this one. The slightly spicy home-made tamale, great on its own, is much improved with the addition of the green sauce. When I order this one, I usually complete the meal with a generous side portion of rice and beans for an extra $4. Another favorite selection is Combination #7 ($6.99), the Deluxe Burrito. For this one, the burrito is stuffed with rice and beans, sour cream and guacamole, with cheese, lettuce, tomato and your choice of ground beef or shredded chicken. It is essentially an entire meal rolled up in a giant tortilla. As with other menu options, you can upgrade to shredded beef for $1 more and get it covered in chile verde sauce for an extra $2. This is my favorite meal when I’m in the mood for chicken, and the portion size is so generous that I often find myself struggling to finish it. In addition to these lunch and dinner options, the restaurant also has an entire breakfast menu and a seafood section. I’ve never ordered any of their breakfast selections, but the word on the street is that the Huevos Rancheros ($7.25) is both great-tasting and an incredible cure for a late morning hangover. The seafood menu leans heavily toward shrimp—both fried and grilled—so during my latest visit, I ordered the Shrimp Fajita Platter ($13.50). The spicy shrimp came mixed in a sizzling skillet with grilled onions and peppers. It was served with a separate plateful of rice, beans and several homemade tortillas (corn or flour, your choice). The succulent shrimp was tender and flavorful, and the ratio of meat to vegetables was close to perfect. Fajitas often seem too greasy to me, but these were a welcome exception. Still, in order to add a little bit of freshness to the meal, I added a side of avocado slices for an extra $2.50. This was a good move. I recommend this one to anyone wanting a twist on classic beef or chicken fajitas. As you use a tortilla chip to scrape those final few grains of rice from your plate, be sure to save room for dessert. For those in a rush to leave, they offer various flavors of ice cream served in a cone. A single scoop will run you $1.25, and a double goes for $1.50. For those wanting to tarry a little longer in the often cramped restaurant, you can get a scoop of fried ice cream, topped with whipped cream and chocolate or caramel for $3.99. They also offer flan, and a jam- or chocolate-filled, cannoli-style dessert called Xango for $3.99 apiece. Much as I’d love to keep Chubby’s all to myself, it is definitely worthy of your time. For us in Rose Park, it is a neighborhood treasure. The food is consistently good, and the staff is both friendly and attentive. There may be more authentic or busier Mexican restaurants in the valley, but whenever I go out in search of Mexican food, I always end up here. 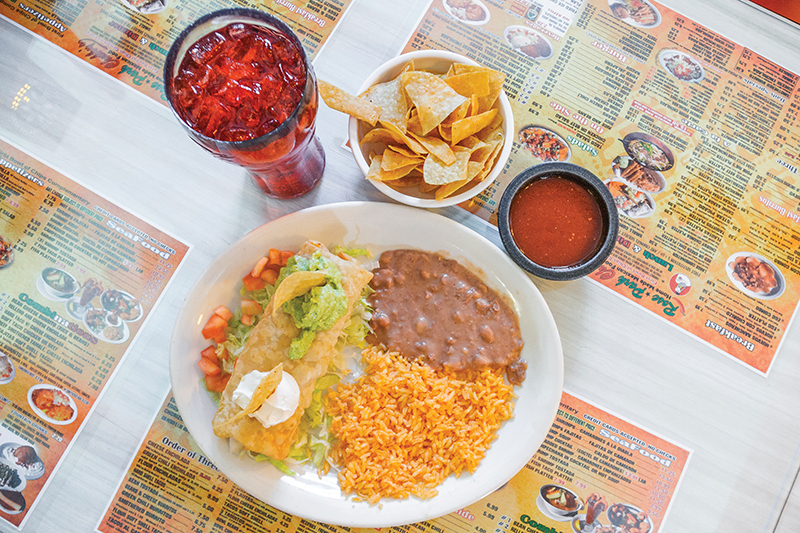 Whether you’re looking for call-ahead takeout or want to dine in and snack on complementary chips and salsa while you wait for your order, Chubby’s is a great source for Mexican comfort food in Salt Lake City.